If you are in desperate need of a temporary copier, fax machine, printer, total network rental or any other type of technology needed for an office (permanent or temporary) anywhere in Texas, you should seriously consider a Texas Office Equipment Rental from Rentacomputer.com. With over 28 certified technicians, engineers and installers all over the state, you can get fast and easy service no matter what it is you need and no matter whereyou need it. If you’re planning on running a temporary office in Texas, temporary office equipment is a must. A certified and personal Tech Travel Agent will be your single point of contact for everything you need to complete your office equipment rental solution, including delivery and installation. And with Rentacomputer.com’s local delivery and installation, all the pain of logistics is taken off your shoulders. Rentacomputer.com offers a wide variety of Texas Printer Rentals to suit whatever office needs you may have. From LaserJet black and white printers to color and even high-volume and low-volume printers, Rentacomputer.com has it all. 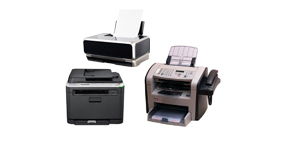 You can even rent a multifunction printer or dot matrix printer if need be. No matter what type of printer you need, Rentacomputer.com can deliver. In addition to that, Rentacomputer.com has a lot of Texas Fax Machine Rentals as well. Along with facilitating your company’s need to produce and duplicate information, your Tech Travel Agent can also help you send and deliver your information by setting you up with one of the many expert fax machine rentals available. Texas Copier Rentals, as well as Texas Network Rental Solutions, are also available. Rentacomputer.com offers a ton of different copier solutions that are perfect for the busy times of the year where companies often need to copy more than normal. Network rental solutions allow you to get everything you need for setting up a new or temporary office. Everything you need to set up a professional network can be easily provided by Rentacomputer.com. So, the next time you need any kind of office equipment in the Lone Star state, consider a Texas Office Equipment Rental from Rentacomputer.com. By going with a company that has over 25 years experience in the field of computer and technology rentals, you know you are going with a quality name and quality products. This entry was posted in Technology Rental and tagged copier rentals, fax machine rentals, network rental solutions, office equipment rentals, printer rentals, Texas Copier Rentals, Texas Fax Machine Rentals, Texas Network Rental Solutions, Texas Office Equipment Rentals, Texas Printer Rentals. Bookmark the permalink.